Located 20 miles west of Milwaukee, in the heart of southeastern Wisconsin’s beautiful Lake Country, the Village of Hartland boasts small town charm and a friendly, relaxed atmosphere. Hartland is proud of its outstanding schools, fine churches, lovely homes, excellent medical facilities, great shopping, services and fine restaurants. Hartland offers an exceptional quality of life, with a unique blend of many positive features: a dynamic economic environment, thriving business community, growing industrial base, lovely residential neighborhoods, convenience, small town charm and abundant recreational opportunities. 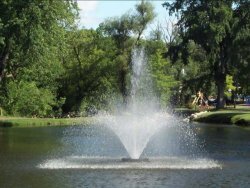 There are twelve lakes within a five mile radius, numerous parks and golf courses, and a number of active civic and community organizations. The Lake Country Fine Arts School and Gallery is a showcase for dozens of local and nationally-recognized artisans.